Here at AKW, we understand that for some, simple tasks can produce great difficulty – things some of us take for granted such as reading a magazine can be a challenge to others. We like to think of others and the experience that we provide them, more importantly, we like to help make this experience as enjoyable and memorable as possible. This is why we have adapted a selection of our guides and brochures to make them accessible for everyone. Now, our guides can be found in multiple font sizes so that every word can be seen to all. This feature has also been incorporated into our new tailorable website, where in the top right-hand corner you can choose the size of the font from a selection of three. This provides for all of our visitors, the visually impaired; the older; and the young to be able to navigate our website simply and efficiently. 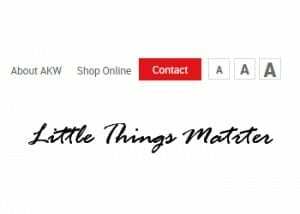 Because here at AKW, we know that the Little Things Matter.